Six people will spend the next year living in a dome in Hawaii in the name of science. 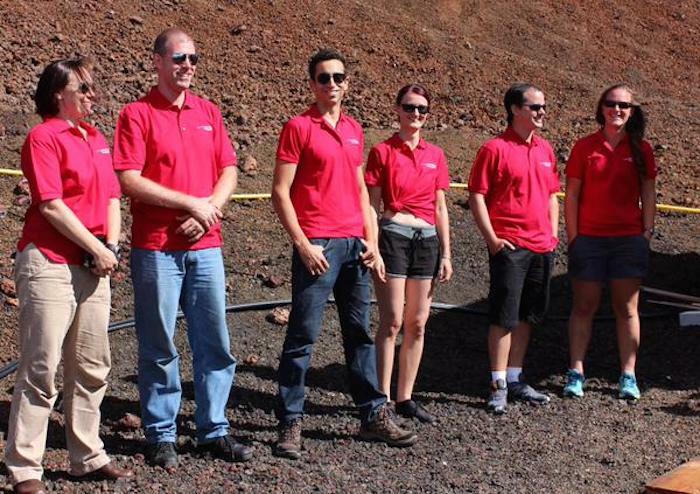 The crew is part of the University of Hawaii's fourth Hawaii space exploration analog and simulation (HI-SEAS) mission, which simulates Mars missions. The six members entered the dome on Friday. They will spend the next 365 days pretending to be on Mars. They'll be living in a two-storey dome where cameras, body movement trackers and other devices will monitor them, according to a University of Hawaii statement. Researchers will study their "cohesion over time, gathering data on a wide range of cognitive, social and emotional factors that may impact team performance." The researchers are working to figure out how to compose and support a good team for a round-trip to Mars. The journey is estimated to last three years. Carmel Johnston, a soil scientist. Christiane Heinicke, a physicist and engineer. Sheyna Gifford, a medical writer. Andrzej Stewart, a light aircraft pilot. Cyprien Verseux, an astrobiologist and doctorate student. Tristan Bassingthwaighte, doctor of architecture candidate. The University of Hawai‘i's HI-SEAS Mars-simulation crew has hit the halfway mark of their mission. he six crew members of the fourth Hawaiʻi Space Exploration Analog and Simulation, or HI-SEAS, have spent more than six months of of their 12-month mission in a solar-powered dome on the slopes of Mauna Loa. The crew has been living in isolation as part of a University of Hawaiʻi at Mānoa research project simulating long-duration space travel. This fourth mission is the longest in HI-SEAS history. As with the previous two missions in the NASA funded study, the current mission is focused on crewmember cohesion and performance. The crew is scheduled to emerge from the habitat in August 2016. In 2015, NASA awarded HI-SEAS a third grant to keep the research project and its missions funded through 2019. Tristan Bassingthwaighte is currently a Doctor of Architecture candidate at UH Mānoa. He has completed his Master’s degree in architecture from Tongji University in Shanghai, where he studied abroad for a year looking at human habitation in extreme environments. His doctoral work involves designing a next generation conceptual Mars habitat. Sheyna Gifford has worked on research projects in astrophysics, neuroscience and psychology and is a contributor to NASA educational websites, a medical writer and an advocate of STEM education. Her previous work includes working on the HESSI satellite at Space Science Laboratories. She holds a bachelor of science in neuroscience and english, a masters of clinical laboratory science and biotechnology, a masters of science in journalism, a doctor of medicine and is currently earning a master of business administration. Christiane Heinicke is a German physicist and engineer. Most recently she has worked on sea ice and has also gained experience working with polar lights, metal melts, and simulations of the Earth's mantle. She received her bachelor of science in applied physics from the Ilmenau University of Technology in Germany and her master of science in geophysics from Uppsala University in Sweden. Carmel Johnston is a soil scientist from Whitefish, Montana. Her previous research focused on the effects of permafrost thaw on trace gas emissions in peatlands. Her interest in global food production and sustainability lead her to HI-SEAS to research food production in Mars simulation. She has a bachelor of science in soil and water science and a master in science in land resources and environmental sciences from Montana State University. Andrzej Stewart is an ardent light aircraft pilot and previously worked at Lockheed Martin as an interplanetary flight controller. He's worked on console for the Spitzer Space Telescope, Mars Odyssey, MRO, MAVEN, Juno and GRAIL. Recently, he served as the flight engineer for the sixth mission of NASA's Human Exploration Research Analog (HERA), simulating a two-week journey to asteroid 1620 Geographos. He earned a bachelor of science in aerospace engineering from the University of Texas at Austin in 2005 and an SM in aeronautics and astronautics from MIT in 2007. Cyprien Verseux is a doctorate student at the University of Rome. He is an astrobiologist working on the search for life beyond Earth and is also an expert in biological life support systems for Mars exploration. Part of his research aims at making human outposts on Mars as independent as possible of Earth, by using living organisms to process Mars’s resources into products needed for human consumption. Six scientists have completed a year-long simulation of a Mars mission, during which they lived in a dome in near-isolation. The group lived in the dome on a Mauna Loa mountain in Hawaii and were only allowed to go outside if wearing spacesuits. On Sunday the simulation ended and the scientists emerged. Previous simulations in the Mauna Loa dome, which is almost 11 metres (36 feet) in diameter and 6 metres (20 feet) tall, have lasted four to eight months. Mauna Loa soil is similar to what would be found on Mars. The area’s high elevation means there is almost no plant growth. The group included a French astrobiologist, a German physicist and four Americans – a pilot, an architect, a doctor/journalist and a soil scientist. They managed limited resources while conducting research and working to avoid personal conflicts. After walking out of the dome crew members reflected on the experience and what it meant for the future of space travel. Cyprien Verseux, a crew member from France, said the simulation showed a mission to Mars could succeed. “I can give you my personal impression which is that a mission to Mars in the close future is realistic. I think the technological and psychological obstacles can be overcome,” Verseux said. Christiane Heinicke, a crew member from Germany, said the scientists were able to find their own water in a dry climate. “Showing that it works, you can actually get water from the ground that is seemingly dry. It would work on Mars and the implication is that you would be able to get water on Mars from this little greenhouse construct,” she said. Crew member Sheyna Gifford wrote a blog post just before leaving about the future of space travel alluding to Nasa’s plans to send humans to Mars by 2030. Kim Binsted, principal investigator for the Hawaii Space Exploration Analog and Simulation, said the researchers were looking forward to jumping into the ocean and eating fresh produce and other foods that were not available in the dome. Nasa funded the study, which was run through the University of Hawaii. Binsted said the simulation was the second-longest of its kind, after a Russian mission that lasted 520 days. 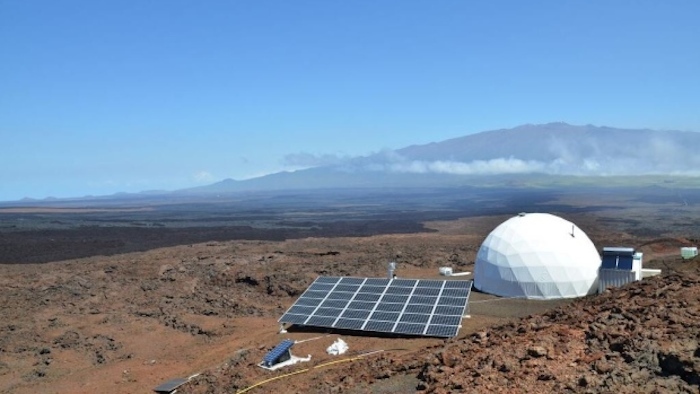 The scientists, pretending to be astronauts, lived in a dome on a remote part of Hawaii for 365 days to simulate what a space mission to Mars might be like. Six scientists on Sunday completed a yearlong isolation mission in a geodesic dome that they could only leave while wearing spacesuits. Scientists emerged on Sunday from the 1,000-square-foot dome on Hawaii’s Mauna Loa to a throng of reporters. The six scientists — Carmel Johnston, Christiane Heinicke, Sheyna E. Gifford, Andrzej Steward, Cyprien Verseux and Tristan Bassingthwaighte — have been in the dome for 12 months to learn about challenges that might face future manned missions to Mars, like managing resources, growing food, and working out conflicts. Just like in deep space, the crew members could only communicate with family and friends via a 20-minute delay and could only leave the dome in an elaborate mock spacesuit. Christiane Heinicke, who is a German physicist and engineer, said that she was most excited to leave behind the spacesuits. Mauna Loa is considered an ideal location for the mission because of its relative remoteness and the terrain, which appears Mars-like with its red, rocky slopes. The study is funded by NASA and run through the University of Hawaii. It’s Hawaii Space Exploration Analog and Simulation’s fourth mission of its kind, and the longest to date. The program is currently seeking applications for the next two isolation missions, which will send teams back to mock Mars in 2017 and 2018 for eight months each. IVY ASHE/Tribune-Herald Andrzej Stewart, greeted by throngs of national and international media, prepares to exit the HI-SEAS habitat on Sunday after nearly one year living beneath the dome as part of a Mars simulation. The mission was the longest American simulation ever. A physician, a physicist and an architect walk into a dome, along with an aerospace engineer, an astrobiologist and a soil scientist. It’s not the start of a terrible joke but instead the premise of the fourth Hawaii Space Exploration Analog and Simulation mission, which came to a close Sunday. 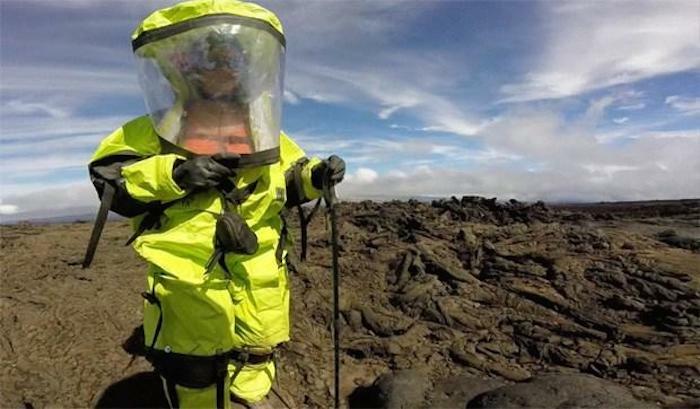 A NASA-funded study, HI-SEAS aims to mimic living conditions on Mars, from location (8,200 feet up the slopes of Mauna Loa, on a reddish volcanic surface that looks and feels extraterrestrial) to protocol (crew members cannot leave the habitat dome without a spacesuit). The fourth mission lasted 365 days and is the longest American Mars simulation to date. HI-SEAS is run by the University of Hawaii. Trays of fresh fruit (pineapple, cantaloupe, watermelon, bananas, to name a few) were laid out as the crew’s first real breakfast. Only shelf-stable foods or freeze-dried items are allowed in the habitat, which consists of 1,200 square feet of floor space, a second-floor loft that has six small bedrooms, and an attached workshop. The dome runs on solar power with hydrogen cells as backup fuel. A year is a long time to spend in the same 1,200-foot space with the same group of people, and that’s exactly the point. Before sending any astronauts on missions to Mars, where resources are virtually nonexistent, NASA researchers need to know how to build the right team. They need to know how that team handles itself in the stress of isolation. Researchers from universities around the country conducted studies on team cohesion even as the crew itself was working on individual projects. Crew commander Carmel Johnston worked on plant cultivation. “I want to find a sustainable way for people to grow in space,” she said. “I think the things we were able to figure out here will help us get into that mindset.” Kale, chard, radishes and tomatoes thrived in the habitat. Red peppers did not. For the crew, maintaining a work-life balance was difficult, considering they lived at their own job site. Though crew members like Johnston and Stewart had long wanted to participate in a space simulation misson, others, like crew architect Tristan Bassingthwaighte, applied on a whim. Bassingthwaighte was studying in Shanghai, in the middle of graduate research on space architecture. He sent off the application after corresponding with HI-SEAS III crew member Jocelyn Dunn. Bassingthwaighte’s research involves designing for people are going to be in “far rougher” places than Mauna Loa, and having firsthand experience with what works and what doesn’t work was enlightening. During down time, crew members read, knitted, watched movies, played Minecraft, and salsa danced. They explored nearby lava tubes from the safety of their space suits, and exchanged presents on holidays and birthdays. At Thanksgiving, virtual reality — a first for HI-SEAS, and an initiative of NASA research partner Smart Information Flow Technologies — allowed them to “sit” at a table with their families and listen to what everyone was thankful for. “It’s certainly very rewarding,” said SIFT senior researcher Peggy Wu. Chief medical officer and crew journalist Sheyna Gifford said she had been impressed by the group’s overall dynamic when it came to solving problems. “As individuals, we’d get stuck,” she said. “As a group, we could work through it. I don’t think there’s a problem we weren’t able to work through (together).” That was particularly true two weeks ago, when the plumbing system failed and the crew had to figure out how to repair it. And the crew went in knowing they could expect some conflicts. “One of the challenges was to talk among the group, and meet the conflicts head on, and make sure they don’t escalate,” said chief scientific officer and crew physicist Christiane Heinecke, who is also a cello-playing engineer. Isolation presented other challenges, particularly regarding separation from family and friends. Although the crew could correspond with people in the outside world, they did so on a 20-minute delay to better mimic Martian conditions. Gifford’s grandmother passed away. Crew biologist Cyprien Verseux, a native of France, had to learn about last November’s terrorist attack in Paris from inside the bubble. Still, during a morning press conference all members said they’d do the simulation again. “There’s just the focus of the mission, wanting to achieve something greater than yourself,” Stewart said. The crew was able to pass that sentiment on throughout the year, though a HI-SEAS blog that let the world know about their work. There are two more HI-SEAS missions planned, both set to last eight months. An application form is available at http://hi-seas.org/?p=5695 and must be received by September 5.